I watch a lot of HGTV, and I'm always impressed when the network's designers whip open a laptop and reveal an entirely redesigned living space, as if by magic. 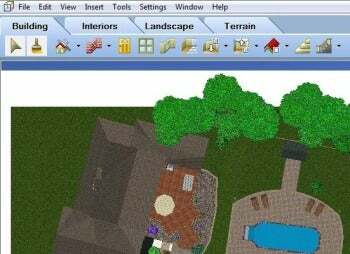 I was hoping to tap into a little of that magic with HGTV Home & Landscape Platinum Suite Version 3, a $50 buy-only application designed to allow novices like me to create interior and exterior plans for a new house or a redesign of an existing one. Several hours and one uncompleted kitchen design later, I'm still waiting for the magic to kick in. Home & Landscape Platinum Suite may be designed for novices, but it requires a sizable learning curve. Even after watching video tutorials and perusing the 672-page user manual, I still find some aspects of the software confusing. But that is, in large part, because this low-priced application offers many, many features. HGTV Home & Landscape Platinum Suite lets you pretend to be one of the network's home design experts. To its credit, Home & Landscape Platinum Suite does guide you through using its many features as best it can. When you begin a project, a tutorial window appears to guide you through the process. And every time you click a new tool, the tutorial window helps you use it. You can turn these tips off, but I never felt comfortable enough to do so. I used the HGTV software to create my dream house, based on nothing more than a design in my head. The experience was fun, though it took a bit of time, especially when it came to adding doors, windows, and interior design elements, like fireplaces. The result was impressive, especially when viewed with the application's 3D capability. The results were less impressive when I tried to use the software to remodel my existing kitchen. That's because I found it cumbersome to place all of the existing elements, like cabinets, sinks, and load-bearing walls, in their exact location. When I was creating my imaginary abode, I was able to fudge on the details a bit whenever necessary, but when held to a more exacting standard, I found the experience frustrating. To be fair, the same was true when I tested the kitchen-specific IKEA Home Planner and Punch Software's Home & Landscape Design NexGen 3. In fact, much about HGTV Home & Landscape Platinum Suite is similar to Punch Software's design suite. Both applications feature many of the same drag-and-drop tools, and the 3D renderings of the buildings you design look very much alike. HGTV's application does come with the branding that many do-it-yourselfers will trust, and it does offer a bit more hand-holding than its similarly-priced rival from Punch Software. I also like how it allowed me to take a photo of an existing room and view it with a different color of paint. This is a trick that HGTV's designers accomplish on-air as if by magic, while I sat at my computer, struggling through my first few attempts. HGTV Home & Landscape Platinum Suite is a capable, complete package, but it also can be a confusing one.